Via Bruce Sterling. 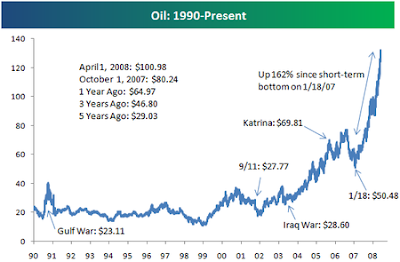 Source: Bespoke Investment Group: Oil Price Chart Since 1990. We are still practicing our economics with a 19th century flawed model..
Oil all energy is a vital infrastructure asst and or resource.. If the purpose of government is to serve the people then providing energy in order to promote commerce is the duty and purpose of government..
We must Nationalize the American Oil Companies if we do this we will create an Economic boom we can cut costs by 30-35% and still have from $50-60 Billion per year for alternative energy development and new technologies which will add to the economic boom.. Many people do not realize that 49% of OPEC is the American Oil Companies and they do not pay $135.00 per 42 gallon barrel they make 200% per barrel or damn close then an additional 33% per gallon of gas.. There's a lot more to this but it's time for us to enter the future these Oil companies are bringing America and it's people to their knees and I for one will have none of it..
Or, y'know, we could use nuclear power, which is now cheaper to create than any other source.